NINE MONTHS AGO, the power and the wealth of the Andofrancine Order passed into the hands of Rudolfo, General of the wandering Army and the Lord of the Ninefold Forest Houses. Nine months ago, his consort, Jin Li Tam, told him he'd finally have an heir. Nine months ago, Rudolfo and Isaak began transcribing the books and records from the devastated city of Windwir from the memories of the Mechoservitors, and collecting them into a new Great Library. Today, many noble allies have come to the Ninefold Forest for a feast in honor of the General Rudolfo's first-born child. Suddenly, as the feast begins, the doors of the hall fly open and magicked, invisible assassins attack. The Gypsy Scouts are unable to fight them off, and all of Rudolfo's noble guests are slain. And yet Rudolfo himself is not touched. And at the same moment, on the Keeper's Gate which guards the Named Lands from the Churning Wastes, a strange figure has appeared with a message for Petronus, the Hidden Pope. Thus begins the second movement of The Psalms of Isaak. FL Speak - When you read a first book and you realize how much you love it, you tend to have great expectations from the second. And Canticle, did not disappoint. The war of the Named Lands is over. Although not entirely. The Entrolusian City states are in civil war. In the last book, Petronus, the last Pope, kills Sethbert in front of the public thereby forever voiding the office and power of the Pope. In the second book, all the characters are moving outwards. The Ninefold Forest Houses are attacked my magicked assailants and two of the top rulers are murdered on the day of the feast. The assailants are later found dead but they were Marsh folk, who were the kin-clave of the Ninefold Houses. 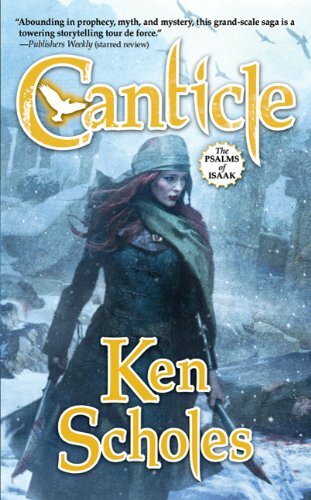 And thus begins the tale of Canticle, where enemies roam within allies and friendship can be discarded in a whim. Vlad Li Tam takes his entire family away from the Named Lands in search of the enemy that destroyed Windwir and infiltrated his own network. And a horrible surprise awaits him whose fate he cannot escape. Everything has been planned from before, including the fall of Windwir and including the death of Vlad Li Tam. When Petronus is hauled for charges against him, the House Y'Zir ascends back to the Named Lands. The Marsh folk are disbanded and a new power has risen. A power that the Ninefold Houses had to accept, a power that could do them all. Lamentation showed how the ruler of the Wandering Army was a pawn in the great machinations of a political game. Now it seems his new born son is the result of the same fate. With no allies and no knowledge of the real enemy, Rudolfo plays a waiting game. Neb, the dreamer who the Marsh folk believed would lead them home is on a separate journey with Isaak. Looks like the Andofrancines believed the threat to the Named Lands so much that they sent metal men to the Churned Wastes to create the Great Library from scratch again. But the Metal Men changed somehow and the Library is not what it seems. And the identity if the messenger for the Emerald Queen will blow your minds away. This book is much darker than Lamentation. The torture scenes, specially. However, it adds to the character's development and and reminds us of the sinister shadowy threat they are actually facing. For a series that's called 'Psalms of Isaak', there is very little of Isaak in the novel. Nevertheless, this is one of the most exciting new fantasy series out there. The political intrigue is thrilling and the way it is moving forward is wonderful. Rudolfo is by far the best character, followed closely by Petronus. The world-building is impeccable and Scholes writes a fast paced tale that is bound to keep you turning page after page. How this series moves forward, now its up to the author. And you can bet am excited as hell.